It's glorious weather and I’ve taken the opportunity to cut the hedge and do those tedious, but vital chores that one has been patiently waiting to do whilst waiting for the weather to change into Summer! Dawn is proof reading Volume 7. She is half way through 1979, while I am sorting out the errors on Volume 6 and doing job, indexing and crediting the persons responsible for assisting us - well done to you all out there who have confidence in us and our project. We are close to finishing this Jubilee edition and are hoping to complete the book within the next fortnight, during our next visit to see the publisher. This will then be sent to Her Majesty. 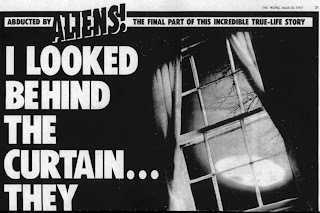 I am really looking forward to doing Volume 8, which covers just one year – 1980 - eleven months of UFO activity, and then the December period. 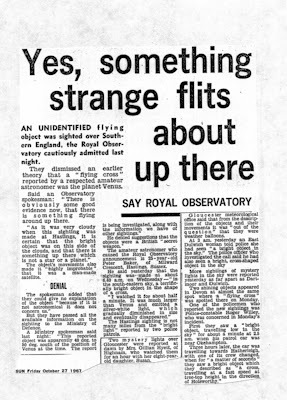 This, of course, relates to the events that took place in Rendlesham Forest. Dawn and I have decided to include Brenda Butler on the front of the book as co-author because of the help that she has provided over the years. We are pleased that Colonel Holt has also sent us a photo of himself and Volume 3, urging people to read the books. We will delay using this photo until Volume 8 and hope to discuss his role further in the events that took place in due course. 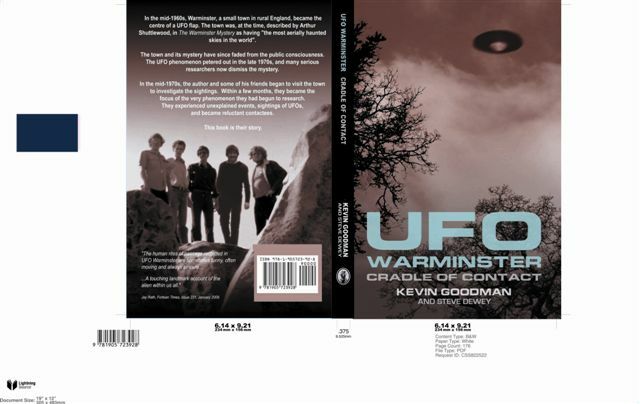 I’m pleased to say that Kevin Goodman’s book is now on sale on Amazon so if anyone wants to know what it was like during those halcyon days of Warminster when all those necks were bent skywards hoping for a glimpse of the ‘thing’ in all its glory, do please buy the book. We received an email from Philip Mantle, last night, and we are sorry to hear that he is not in the best of health. 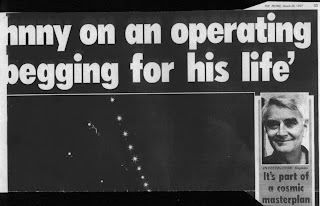 We hope that he makes a recovery from his ailments, and congratulate him on his forthcoming marriage. Philip has on occasion assisted us with various photographs and a foreword for one of the books. 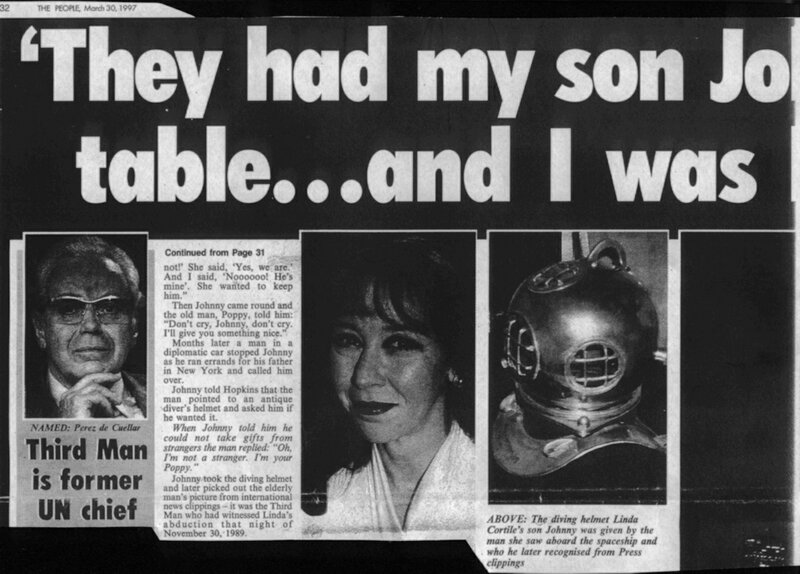 On October 4, 1967, a strange event happened in the waters off Shag Harbour, Nova Scotia. A plane crash? A military exercise gone wrong? Or a UFO? 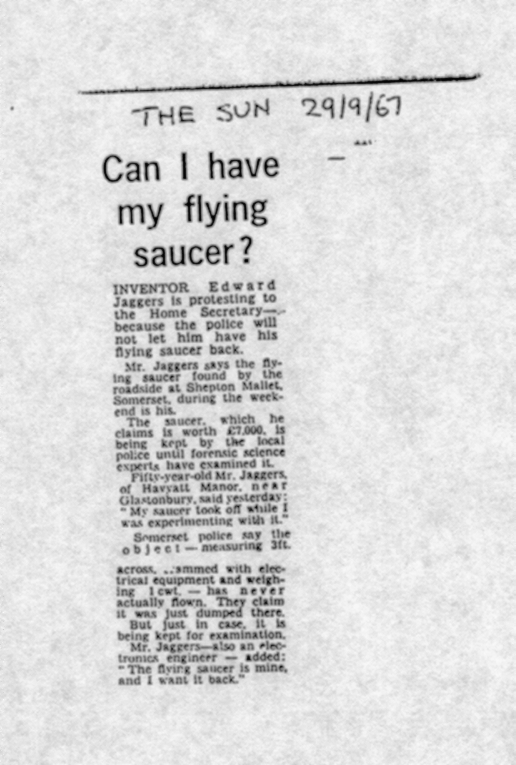 ﻿No one knows for sure, but the Shag Harbour Incident remains Canada's only UFO sighting acknowledged and documented by the Canadian government. This year marks the 45th Anniversary of the incident. We will be having our festival on Aug. 3rd and 4th. Here are the details: Aug, 3rd - the Centre will open at 9am - 10 am we will have a barbecue - 1pm at the Community hall we will have two locals Laurie Wickens and Havlock Cameron recall their memories. Havlock was one of the people who saw the object leave the Shag Harbour sound a week later - they will be joined by Chris Styles. At 3pm we will have a meet and greet time at the Centre for people to speak with Chris. In the evening we plan a kitchen party. On Sat. 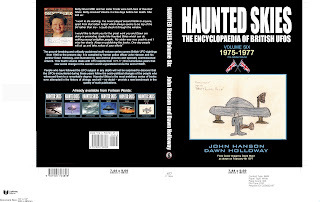 9am we welcome Donald Ledger and Chris Styles to talk on the Shag Harbour story and other maritime UFO's. There will be a parade at 2pm, our attendant Karmen will do face painting for the kids at the Centre. Behind The Paranormal with Paul and Ben Eno - Saturday September 22, 2012 at 7pm. 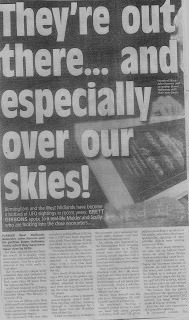 Following the successful 30th Anniversary Rendlesham Forest Conference and the Rendlesham Forest 2012 UFO Conference, we would like to announce that on the evening of Saturday September 22nd, 2012 there will be some special guests here in Woodbridge. Paul and Ben Eno of the hugely successful Behind the Paranormal radio show in the US will be making a guest appearance and presentation at a hotel here in Woodbridge, Suffolk, England. We have the location finalised and the time will be approx 7pm until 11pm. There will be an additional special guest also if we can sell all the tickets. Take a cosmic journey into the paranormal with American radio personalities Paul & Ben Eno, a father-son team with a combined 50 years of experience, whose work has turned upside down our entire understanding of ghosts, UFOs, cryptids and all things bizarre. 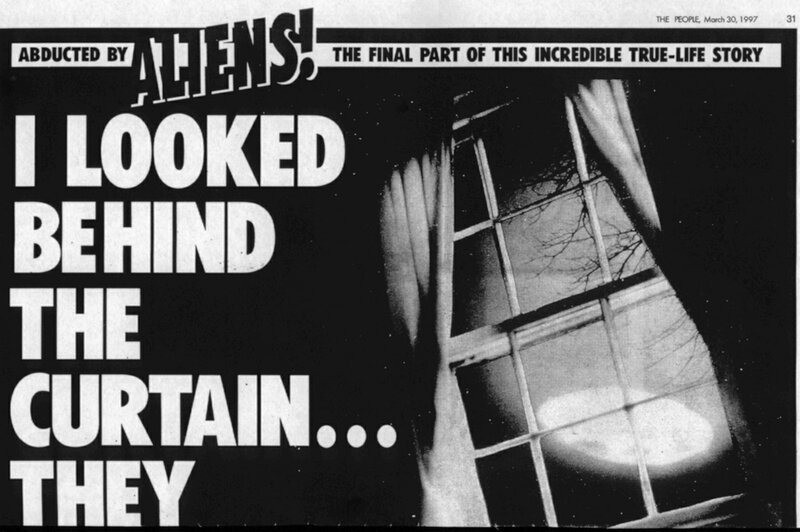 The ultimate focus of their presentation today: The true extent of happenings at Rendlesham Forest, including the UFO incidents of 1980, and what they might really mean for this part of England and for humanity. Paul is a 42-year investigator, award-winning journalist and bestselling author who was expelled from his studies for the priesthood in 1977 because of his early work in the paranormal. Ben, along with being the youngest syndicated broadcaster in America, is a practicing shaman whose abilities have awed even his teacher, a full-blooded Mexican Aztec shaman. In this interactive presentation, join Paul & Ben on a journey through Paul’s early ghost cases, where the old theories just didn’t add up, all the way to his and Ben’s modern run-ins with “parasites,” alien “grays,” inter-dimensional life forms, secret bases and government agents. The presentation will conclude with a “town hall” style meeting on people’s experiences in the Rendlesham Forest area. The Grove House Hotel 39 Grove Road Woodbridge IP12 4LGThe talk starts at 7PM. Tickets are £15 each plus £2 for paypal reservations only to cover their fees and postage. Entry is strictly ticket only. We accept paypal, cheques and postal orders. Several children returning home after playing, heard a sound like a bell and saw coming out of the wooded area about 60 little gnome like men with wrinkled faces and long white beards, they were about 2-foot tall and were riding small bubble-like vehicles. The beings rode over the swamps near the lake and some chased the children towards the gate of the park. Some of the humanoids wore red hats and green pants and seem to be laughing in a peculiar way. The children ran from the area. (Source: Fortean Times GNOMES, some of whom chose to play with the kids some). 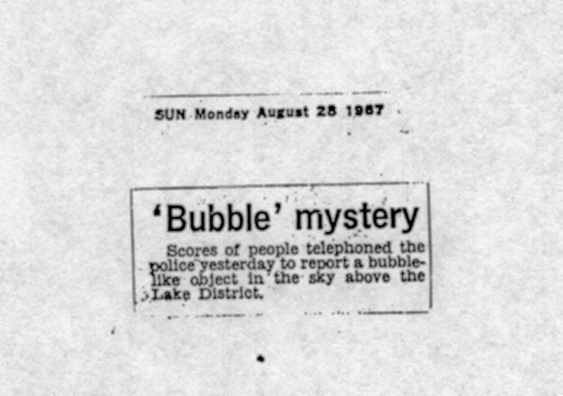 Sometimes amidst the thousands of reports of UFOs seen by us over the years, there are the occasional ones that stick out in your mind. 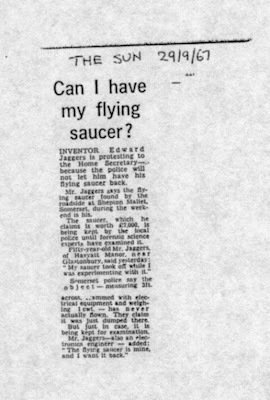 They would include the UFO landing in July 1955,at Bexleyheath Kent ,RAF Pilot James Saladin’s sighting while piloting his Jet fighter, in 1954 the weird events at RAF Alconbury when a leaping man was seen, Jessie Roestenberg's sighting of a craft and its occupants in 1954 the many sightings at Cradle Hill in Warminster during the 1960 and 1970 period. 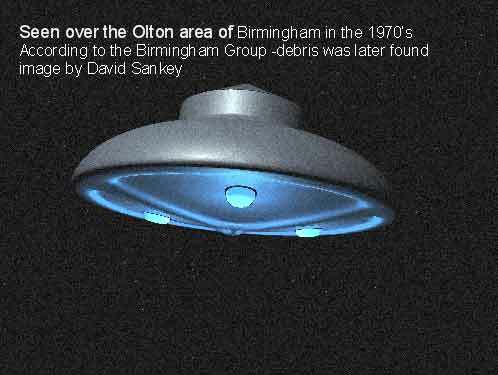 It began innocently enough with a report of a light in the sky seen over the Midlands in August 1971. 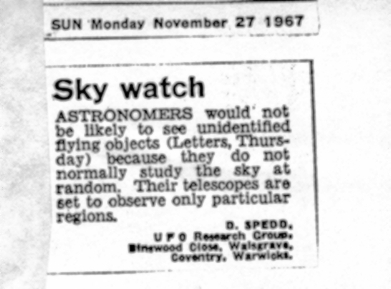 This was later reported to Derek James. 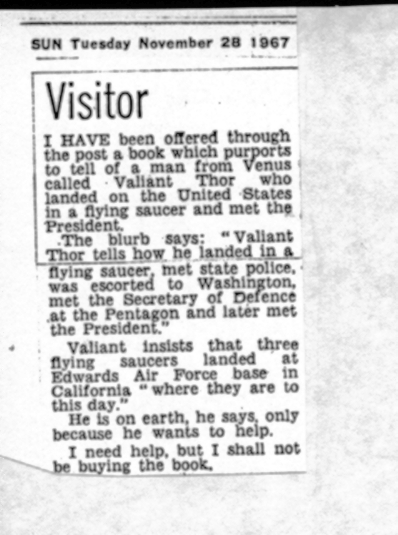 The man concerned told Derek that after having reported the incident (we presume to the MOD) he received a call from the MOD advising him that he had seen the Russian Satellite 408. 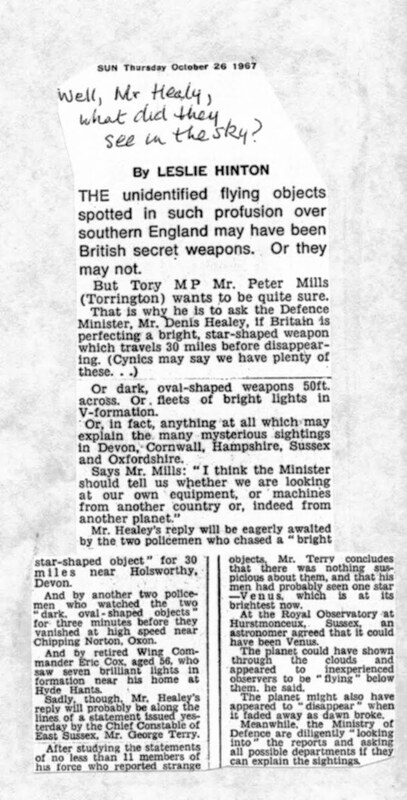 This in itself is strange and out of character for the MOD, who were not in the habit of making telephone contact to witnesses unless they judged the sighting worthy of further investigation . 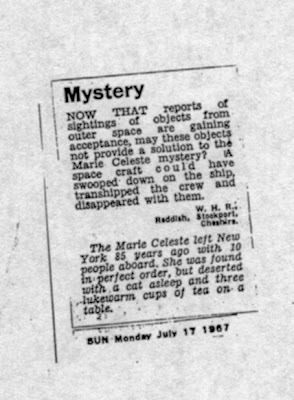 Derek as a matter of routine checked the trajectory of the Cosmos 408 and found that it was over Newfoundland at the time of the sighting and was not even visible from the UK. At some stage the witness contacted Derek and told him that over several nights running he had seen two strange men parked in a black Jaguar outside his home. Derek decided to contact a relative of his - a senior officer on the local police force - and informed him about the car acting suspiciously with the two men in it, wondering if they were keeping observations on a nearby large toy manufacturing business premises, with a view to committing a criminal act at some stage in the near future. 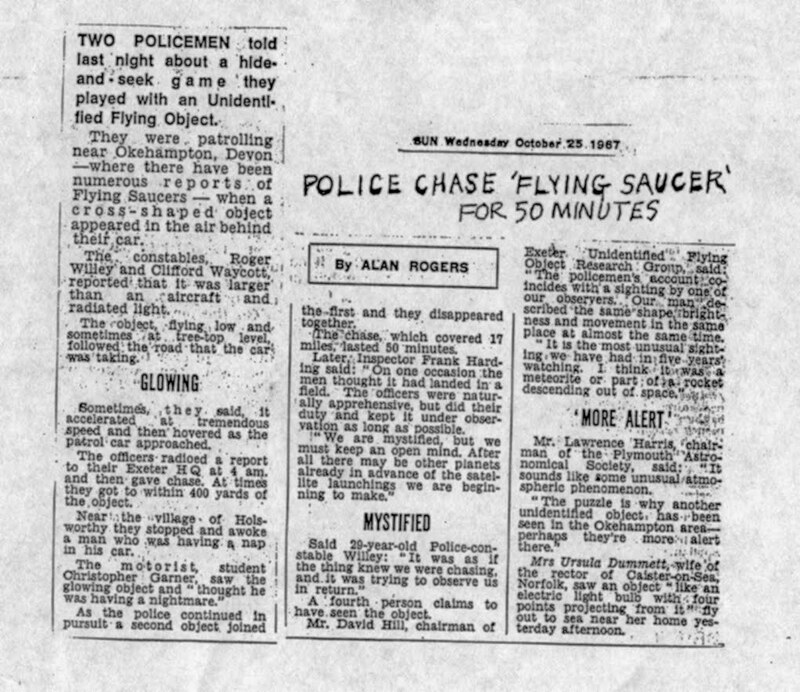 Police observations were set up; in those days they would have involved a plain police car with two plain clothes officers in it watching, rather than the covert technology in use by present day police forces during close watch surveillance. But this was the 1970s! 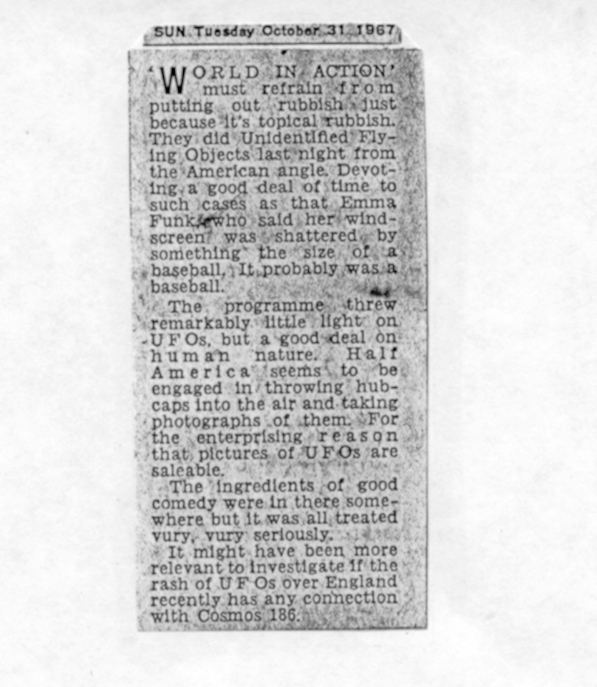 This was, and still is, an amazing case. What a pity we never had the opportunity to talk to the officers, and obtain further information such as, what was the registration number of the car, as presumably somebody must have checked it out on the Central Vehicle Card Index- a long winded process (before Police Computers with links to the PNC were up and running)? 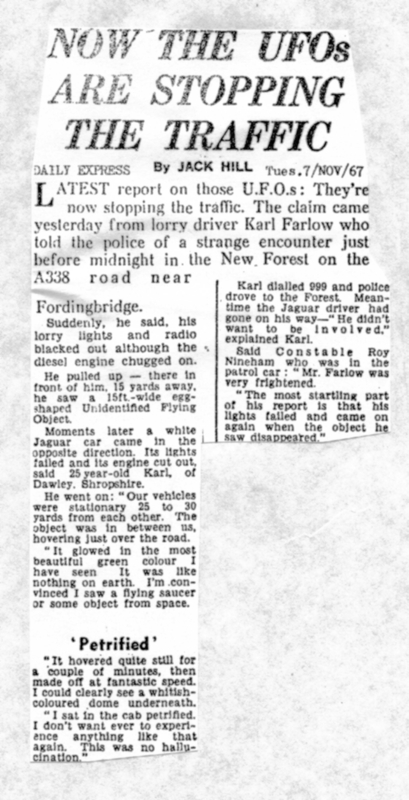 The author John Hanson himself remembers an incident in the 1970s when a police vehicle recovered an abandoned motor scooter from the side of the motorway, but was unable to trace the registered owner details for a few days. When they did receive the information he was found to be reported missing. A return visit to the scene found him deceased down an incline at the side of the motorway – nobody thought to look, incredible but true! Were any photographs taken of the vehicle (unlikely but not impossible)? What happened to the written logs and how as this matter explained away satisfactorily to the senior Officers?What were the descriptions of the occupants of the vehicle? Did they sit in the car all night? What happened to the vehicle after it was driven off? Surely surveillance on this car would have been continued. Where did it happen, somewhere in the Midlands? 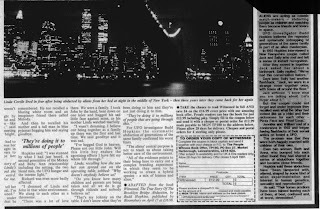 Jenny advises us in the original article that none of the names, addresses or the specified location can be published, but that they are on file; even more frustrating - yes we accept the need for confidentiality, but surely the location could have been identified. We tried to trace Mr James but were unsuccessful –likewise a letter sent to Jenny was never answered, but that is assuming she ever received it. Haunted Skies Blog July 12th 2012. We are busy at the moment downloading the MOD files which have been released, and I have to admit that I haven’t even examined the last lot! Still, at least they will be on file and prove a source of assistance to the many other cases that we have on file. 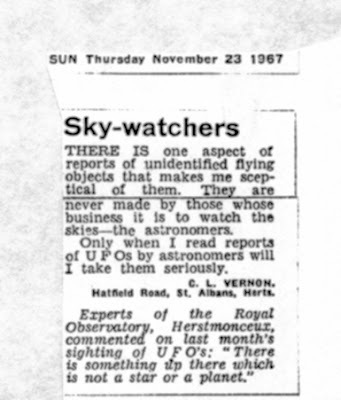 I see that the papers have trotted out the old comment about 95% being explained – which in my opinion, based on our research, is ridiculous. 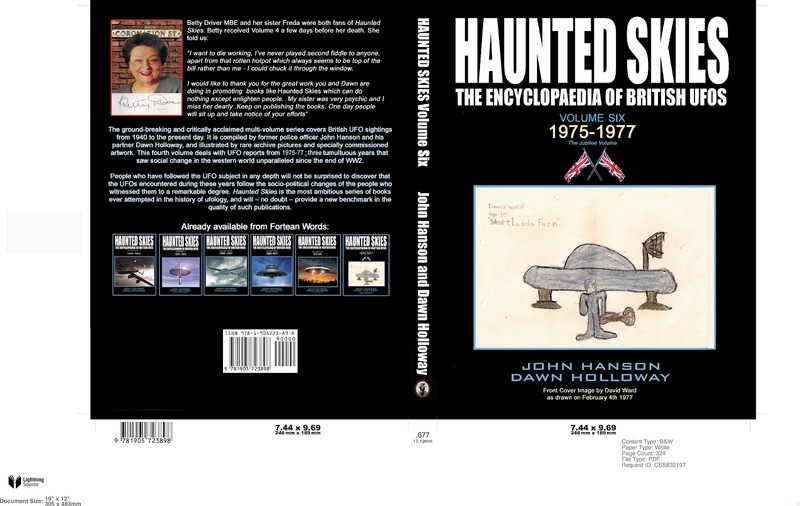 If you want to see the files that are never released, read Haunted Skies as they are published, in fact have a sneak preview, you’ve earned it! Here is an illustration created by David Sankey showing a craft that was sighted over Olton near Birmingham in the 1970s. In September last year, Holly my daughter was born almost 3 months early. She weighed just 2lbs 5ozs she was very poorly and spent over three months in the special care baby unit (SCBU) at Kettering Hospital. She had lots of problems, including bleeding on her brain, bleeding in her lungs and a pronounced heart murmur. Of course we could never have anticipated this and found ourselves somewhat bewildered and terribly worried for Holly. What we didn't expect was the SCBU accommodating us within the unit so we could be close to Holly. The thought of leaving her overnight was unbearable. The unit has created a parents’ suite - funded entirely through charitable donations to allow Mums and Dads to be by their baby's side. Here is some publicity in the local Birmingham Mail this cost us a free volume of Haunted Skies, but we think it’s worth it despite the usual slant on reports such as these. 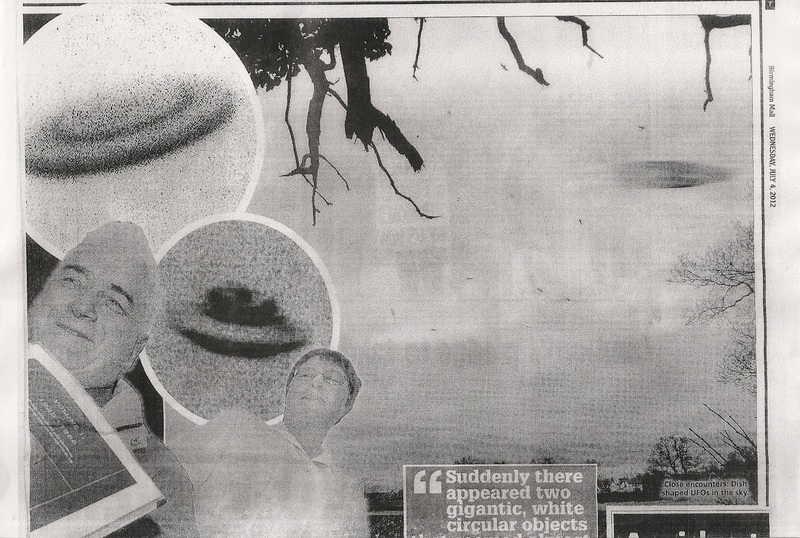 Here are some chapter headings from the books ahead..
Barnoldswick, Triangular UFO over Essex, Strange lights over Belper. Ray Brown with a degree in structural engineering was working for a Backcountry Developer in May 1990, redeveloping wasteland next to the old Tipton gas works, which involved clay capping certain areas where toxic chemicals had built up into unacceptable levels, from strip mining ground worked back in the early part of the 20th Century. As past of this clean up operation huge concrete floors left over from demolished factory buildings were blasted and then broken up by smashing them with a huge demolition ball operated from a crane, powered not by modern hydraulics but diesel. 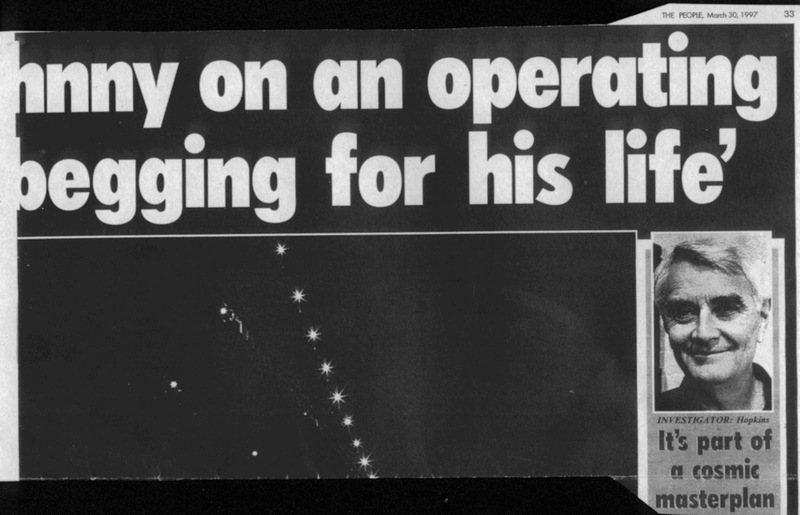 Ray: "The incident with the crane was totally inexplicable. I cannot understand what forces could have raised the gib up. Something even stranger was to take place when, as I was in the process of leaving the site, at 4.30 p.m., I noticed three objects moving against the wind over Merry Hill. Puzzled by what these objects could be, I stood watching and then realised they were approach­ing the construction site, by which time I could make out what looked like three grey coloured 'spheres' in a triangular formation, rotating as they moved across the sky over nearby fields. 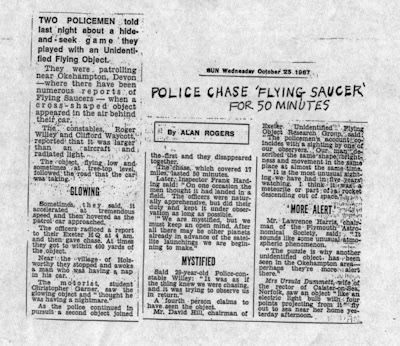 Ray told us the sighting had lasted seventeen minutes and that he had reported the matter to the Birmingham UFO Society, run by Rob and Marilyn Aldworth, (who was to tragically commit suicide some years later) and that within twenty-four hours of the incident taking place, he began to itch and noticed a strange rash covering most of his body, apart from the face, hands and back. During conversation with him about this rash, he became quite emotional and unbuttoned the front of his shirt, revealing that his arms and chest were covered with red, scaly, patches, diagnosed as Psoriasis - (A condition that can appear anywhere on the skin, usually starting off as small red spots before eventually forming circular or oval patches, fifty to seventy-five millimetres across. 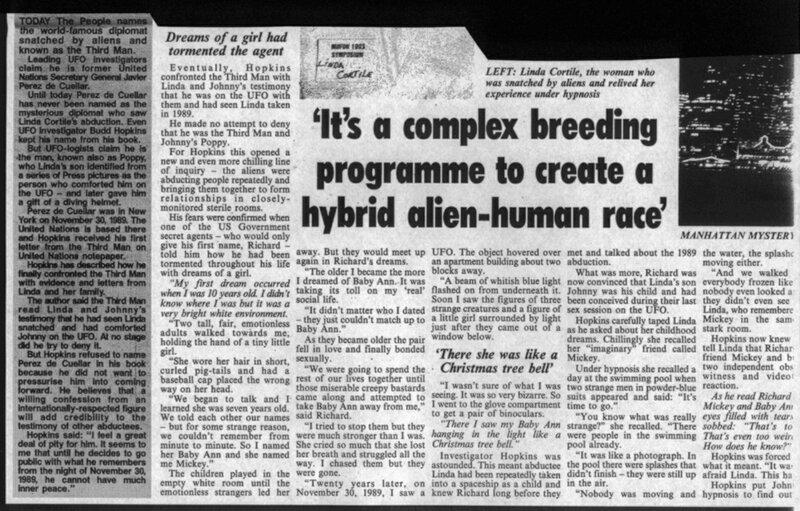 )At 10.20pm, the 2nd of June 1990 bright white lights were seen hovering in the sky over Convey by local resident Denise Radley, “It looked like a car head lights they came towards me out of the sky, two big white beams, it sort of hovered for a while then went over the houses and away, we saw a red light behind it, it resembled an upside down saucer, I have never seen an airplanes that hovers like that silently." 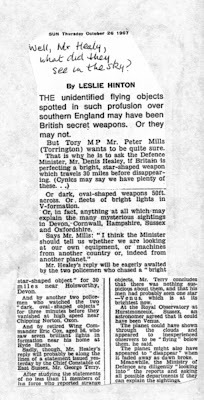 A UFO described as oblong in shape was sighted by a number of people moving across the sky over Stansted on the evening of 30th June 1990 .One of the seven witnesses was an ex RAF, serviceman out fishing with his uncle by a lake when he spotted something heading towards the airport from the south. 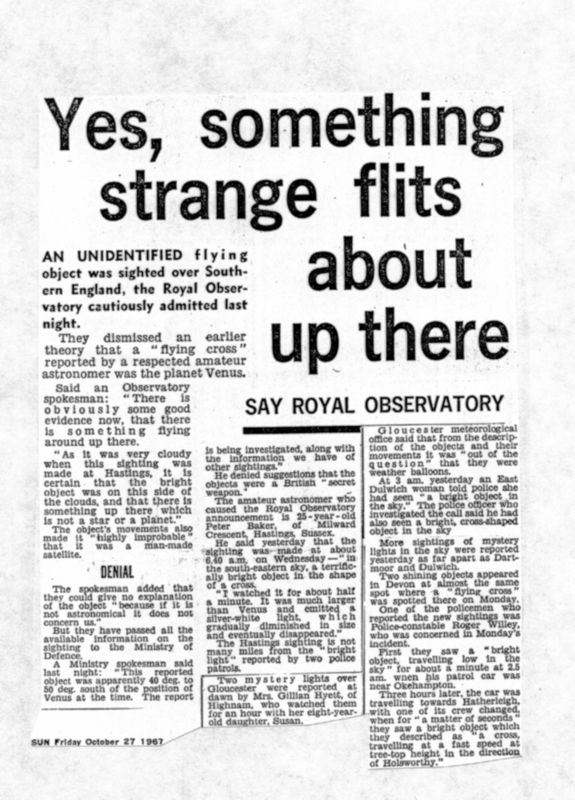 “It had an oblong front, was lit up with searchlights, and flat around the back with two red lights to the rear there was no engine noise despite the fact it was just 200 yards away from me, it sat about 10 minutes, then the lights went out and it disappeared”. An unnamed Police officer who attended and took a statement from the man contacted Stansted Airport about the matter when he learnt from staff there that six other people had reported similar sightings. A Ministry of Defence spokeswoman said: "The vast majority of reports we receive are very sketchy and vague. Only a handful of reports in recent years have warranted further investigation and none revealed any evidence of a threat." 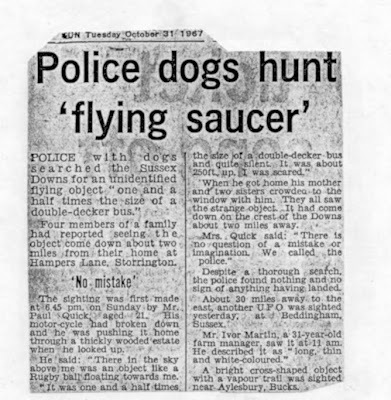 On the 30th of July 1990 four members of a family from Hopton Great Yarmouth sighted a “red object with a rear light apparently descending over farmland, the following morning a circular impression was found in the grass surrounded by ten equidistant smaller circles” (Source: Ivan W Bunn /David Dane/Eastern Daily Press). 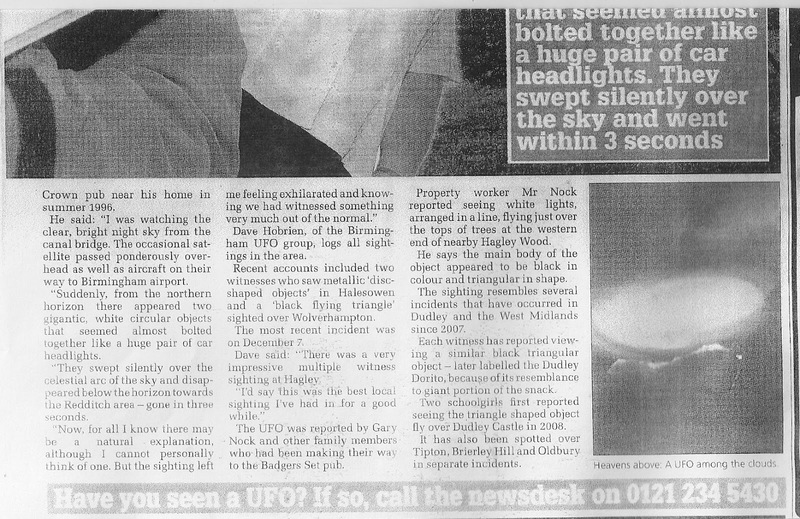 This would appear to have been the same evening when a,” cylindrical object showing two large red lights at, the top and bottom with an orange light either side of the middle making a heavy laboured noise,” was seen by Porton resident Jane Manning Philips at 10.30pm, who watched it fly over Porton School towards Highpost and then round to Boscombe Down, where it disappeared from view. Mr T Holloway wrote to us in 2010………. 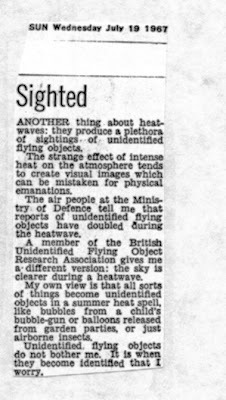 Having read your article in the local paper I thought I would pass on to you three "sightings" I have experienced, if they are of any interest to you. 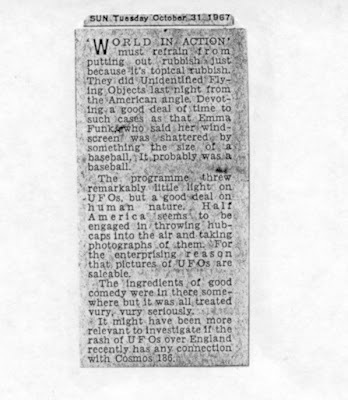 The first happened around the time that you are researching, it happened around 10 pm during the summer. I was lying in bed watching the stars in the southern sky towards Westbury/Warminster when appearing from the west was a large orange ball. 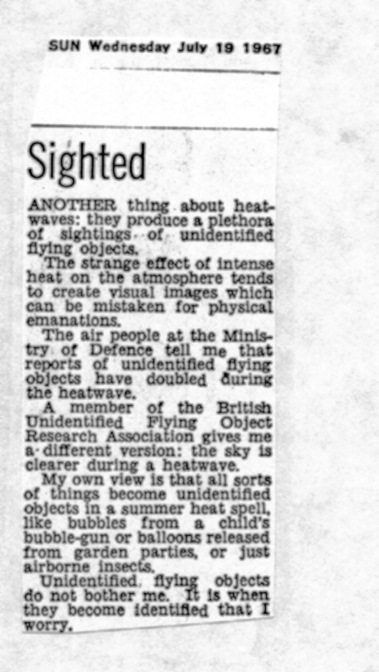 Not only was the object the colour of an orange it had the surface covering like an orange[dimpled] It stopped moving and appeared to explode into many smaller balls that flew all over the sky to disappear. The small balls then reappeared and joined together to form, what I would call a dumbbell shape, the shape then changed to an arrowhead shape with rounded corners on the two lower corners with a slight convex between the two points. The shape then changed again into the dumbbell shape and flew off in an upward direction. The second "sighting" happened about 1990 late in a winter's evening whilst I was walking my dogs. Both dogs were trotting along in front of me when they both stopped, sat on their haunches and looked up, I followed their gaze and saw two large black discs travelling across the sky from west to east. The only reason that I could see them was because they blanked out the stars as they moved across the sky . The total time it took them to travel from my right horizon to left horizon was about 4-5 seconds. After they had passed my dogs stood up and carried on walking. There was no sound of any description. 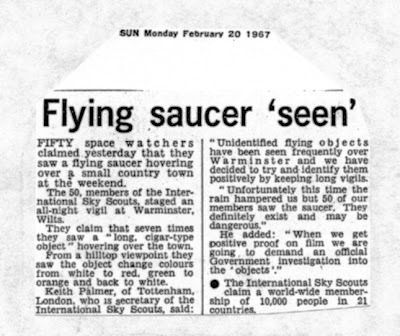 The third "sighting" was about 2 months ago, reported in The Wiltshire Times. 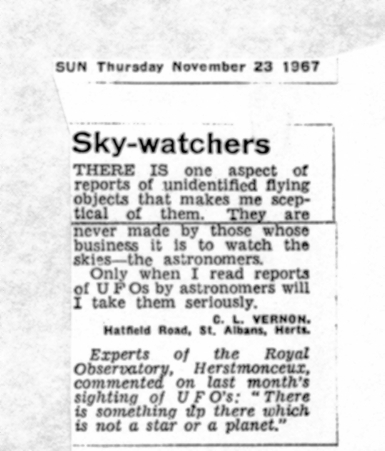 What I saw, in the northern sky, was 4 orange lights, 2 large and 2 small, forming the four corners of a square. The lower of the 2 smaller lights were joined by 2 very small, 1 red 1 blue lights the 2 smaller lights then disappeared followed 2-3 second later by the 2 larger ones. I would like to point out that I am not, for the sake of a better phrase, a UFO "nerd/freak". I try to keep an open mind but feel that so many sightings from so many people all over the world that there might, just might be something. I hope this may be of some use to you." 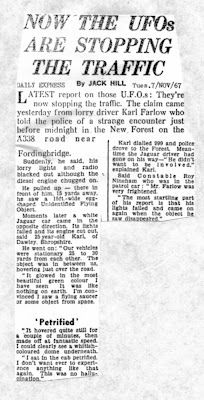 John Turvey from Evesham Gloucestershire wrote to us with regard to what he experienced while driving towards Bredon in the Worcestershire area in the summer of 1990.”It was a particularly fine dry evening, at the time when I noticed a curious ‘light’ appearing and disappearing between the trees and hedgerows, as if pacing the car from one side, this went on for several miles, until whatever it was rose up vertically into the sky at tremendous speed, and was soon just a tiny speck of light in the starlit sky’” The next day he eagerly scanned the local newspapers hoping to find other reports of a UFO being seen, there was nothing, when he tried to tell people what he had seen they laughed at him and suggested he had seen a shooting star! Our Apologies to Don and the Guinness Book of Records for using a photograph of that delightful kitten in the previous blog. From Don an update on the Kittens. Re: previous blog. 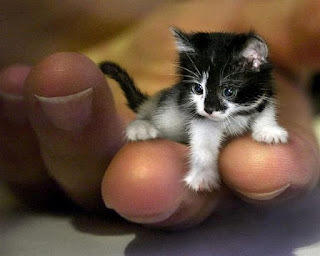 "Could you amend one thing for me please , that photo of the kitten isn't MY kitten , it was an email of a 2yr old kitten my friend Ginnette had forwarded to me that’s in the Guinness world records . She knows I’m a true animal & wildlife lover so she sends me all manner of cute , funny , or just plain weird pet or general animal photo's & links , so it was that email that I forwarded onto you , so if you can at your convenience stick a letter T in and change the word his for this. Talking cats its been a nightmare here as 4 cats went missing for a full 24hrs having disappeared the previous night around 8pm when we last saw them on the neighbour's wall looking into the next street. The following day we thought they might have come through the cat flap during the night but there was no signs of them and naturally you start imagining all kinds of scenarios, but all day on and off we kept calling them and went out looking in gardens locally , then at around 8.07pm one of the silver tabbies appeared in the back garden, then 20mins later we heard meowing and found another tabby out in the front garden, which was a surprise as she's never even seen the front of the house or front garden so how she found her way home that route is a mystery, then the mum appeared in the back garden so we were just missing Smudge Monkey as we call her, and it wasn't until almost midnight that she finally appeared on the fence and took ages to decide to come in for a feed . We've no idea where they'd been or if they'd been together or what had happened to make them disappear like that , but cats are a real worry. However, you can't restrict or tame a free spirit so I think its time to buy a bottle of Kalms and prepare for the future with these 4." On the way home the other night we came across this delightful slug and took a photo of it, the coin is a twenty piece which give you an idea of the size, I though it was quite pretty. 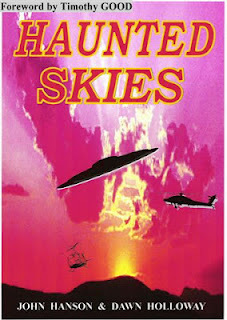 It’s been a tiring few days following a visit from Richard D Hall, who interviewed me about the Haunted Skies books, and some other cases more up to date. 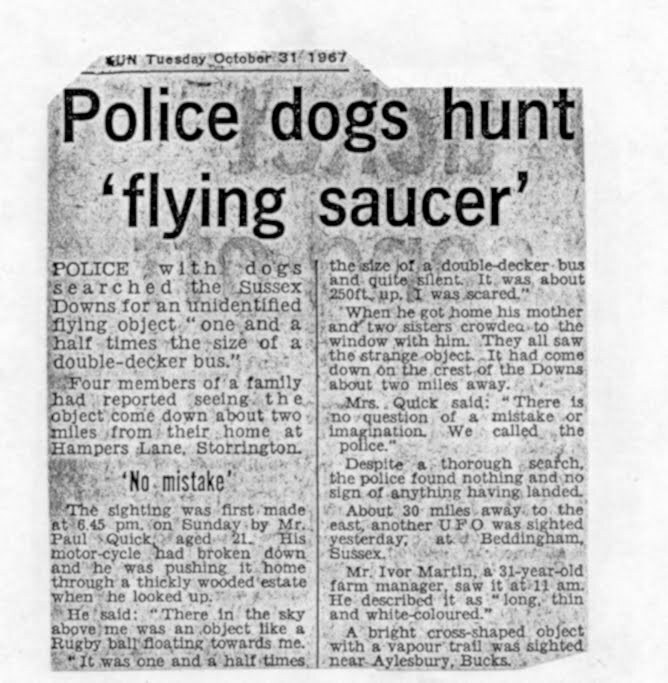 These included an examination of an incident in 1994 when a retired Police Officer sighted a UFO while out fishing. As result of him informing the MOD, he was later subjected to some harassment. The investigator, John Jenkins spoke about his early investigation and then the retired officer gave his viewpoint. We also discussed what appears to be the recovery of an alleged implant and some harassment afterwards to the party concerned, who also gave her side of the matter. 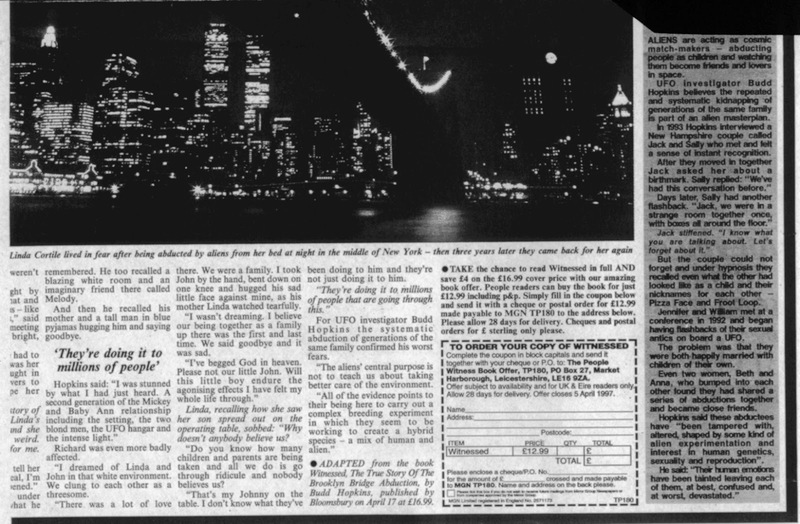 This took place in 1995. Richard was very pleased with the interviews, and is in the process of ordering a number of books from the publishers, which will be available when the programme goes out in a couple of month’s time. Devon Libraries have now begun to stock the books, which is also great news. Don Ramkin from London sent us a photo of his gorgeous kitten. Kevin Goodman has been in contact and tells us that his republished book Cradle of Contact is due out on Amazon any day now. Well done Kevin! Kevin is also giving a talk at the Weird Weekend in August. We wanted to show you the original cover for Haunted Skies, which we paid £40 for to some guy in Suffolk, who we met while walking through the forest. I gather he was peeved that we didn’t use it - sorry we changed our mind! Hope you enjoy the review. 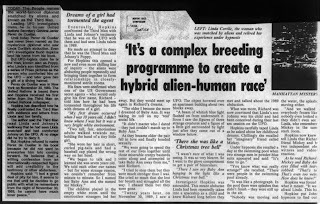 You have permission to forward the link via E-Mail or on any forums, although if you wish to copy the article it for use elsewhere please contact me directly for approval. Last Wednesday morning (Solstice) we drove to the Henge Bookshop in Avebury , and after having a chat with Esther and John, who are now selling Haunted Skies books, we came across a friend of ours, ‘Viv’. 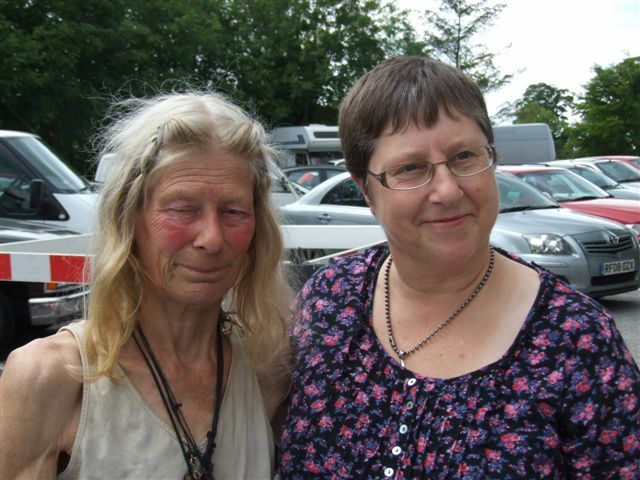 She was in the car park opposite with her friend Graham, and lives in Glastonbury. She is a talented artist and an old friend of ours. She drives ‘Luis’ the van, and it was Dawn who was the first to spot it. We then bumped into Denny Clarke, a lady who we knew from yesteryear, and who was showing some American tourists around the stones. We handed out some business cards and showed them the books and after kissing her goodbye, we walked around the stones and introduced ourselves to various people telling them what we were doing. Suffice to say there were not that many people about, as it was mid-week and the weather was not very good. We stopped off at Marlborough Library and spoke to a friendly librarian who asked that we leave a book with her in order to ask the committee whether they would be prepared to stock Haunted Skies. 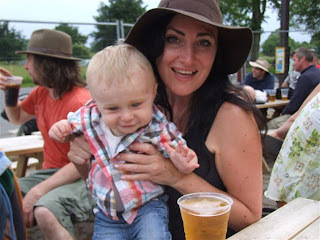 We then went to the Red Lion public house and had a drink and chatted to Alfie the baby (well at least to his beautiful mum) before walking over the antique shop where we were shown some UFO books that had belonged to Andrew Collins, who used to live in the Avebury some years ago. The owner told us about a UFO sighting he had had with his daughter during the 1990s when they saw a cigar-shaped object showing flashing lights hovering over the village. 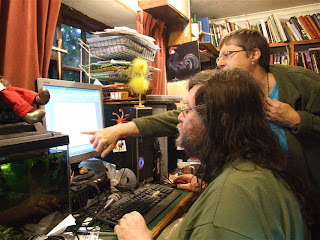 We then made out way to Eastfields where we parked for the night in the car, after having visited the car park at the top overlooking the fields and speaking to tourists who were looking for the recently formed crop circle that had appeared a few days before. We were told this was a hoax, but didn’t see it ourselves. After a hardy night we set off across country to Glastonbury, where we made our way to the Gothic Image bookshop where we were asked to leave two books for them to make a decision about stocking Haunted Skies. We then continued our journey to Devon where, after enduring the pouring heavy rain, we arrived at the publishers on the afternoon of Friday, by which time I had began to develop a heavy cold, which I still have today. 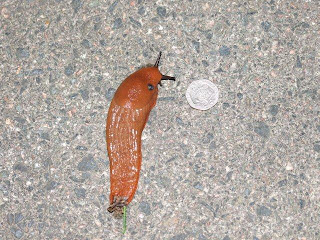 No doubt sleeping out on the side of a rain-soaked hill is not good for your health! 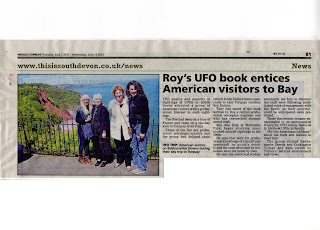 We are in the process of completing Volume 6 which will cover the period of British UFO history between 1975-1977 and Dawn is proofing Volume 7, 1978-1979. I am working on Volume 8 which will cover just one year: 1980! And what a year that is going to be!